Before they got their big government loan, we used to use Solyndra as an example of a small company we helped name, that went on to be big. In fact, we met with the founders before they even had an office. Today we still have a policy of trying to accommodate small startups – in case they are the next big. Then for a while they looked like the poster child for US solar technology… but unfortunately crashed dramatically and were all over Wall St Journal and other papers as politicians used them to throw rocks at Pres. Obama’s growth plans. Not much was said about the earlier VC investors who put up huge amounts to get them to that point. 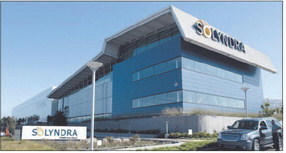 Mega new Solyndra factory building right off 880 in Fremont, CA sold to Seagate. Are they bringing disk drive work back onshore? Anyway, I thought that was all history now when low and behold they are twice in the local paper yesterday. 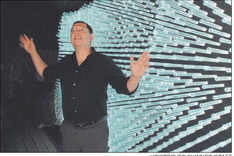 Once for some creative artists who are making “light sculptures” from recycled Solyndra tubes and once for their interim management finding a local buyer (Seagate) for their prime real estate factory in Silicon Valley. Perhaps the FEDs will get some of their money back after all… and it does show the wisdom of taking big risks in the right parts of the country. Where else could you have sold such a big modern factory/office building in a prime expensive location so quickly? Incidentally, when Alan Shugart originally founded Seagate, he had left his previous disk drive company that was called Shugart Systems – where he had to leave his own name behind too! Hence the similar, but smart and different, Seagate name which is today the name for the combined entity.